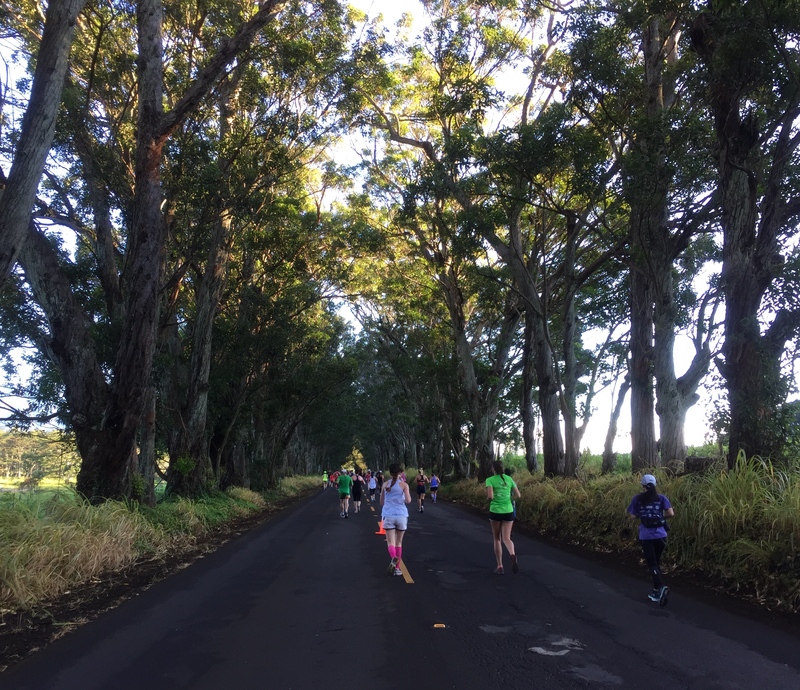 My most recent race trip took me to Hawaii for the Kauai Half Marathon. I was never interested in visiting Hawaii. For someone who lives on the East Coast, Hawaii is a long trip – over 10 hours alone on airplanes, not my idea of a fun time. Then I saw the movie “The Descendants”. The Hawaiian scenery was beautiful – palm trees, blue ocean water, white foamy waves breaking on sandy beaches with the mountains in the background. I decided I wanted to see that Hawaii in person, not the “Hawaii Five-O” version I see on television. Since Hawaii is one of the 50 States, I was obligated to run a race there anyway. 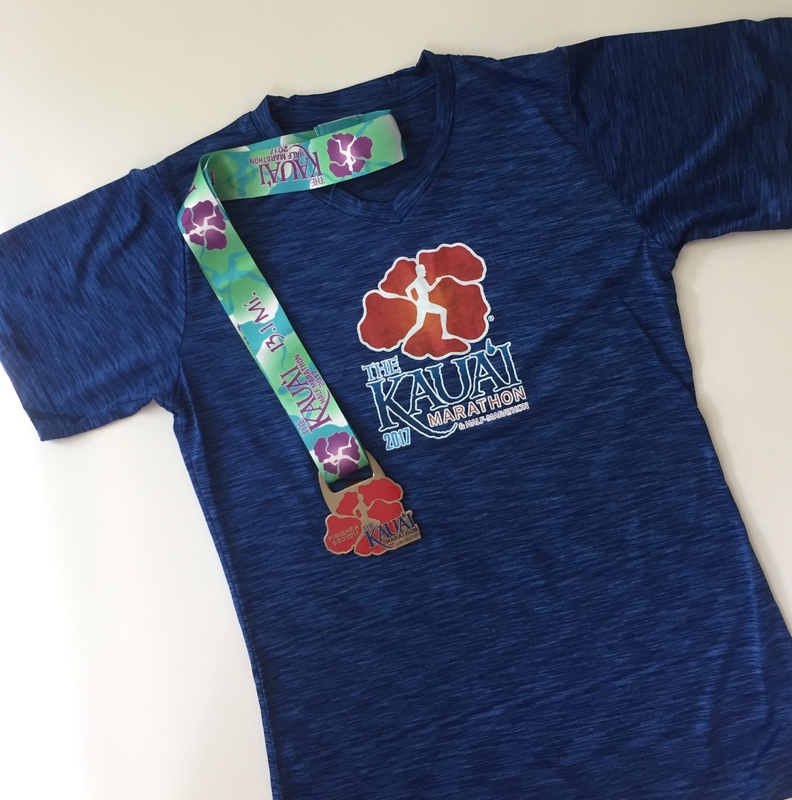 With “The Descendants” in mind, I picked the Kauai Half Marathon as my Hawaii race. 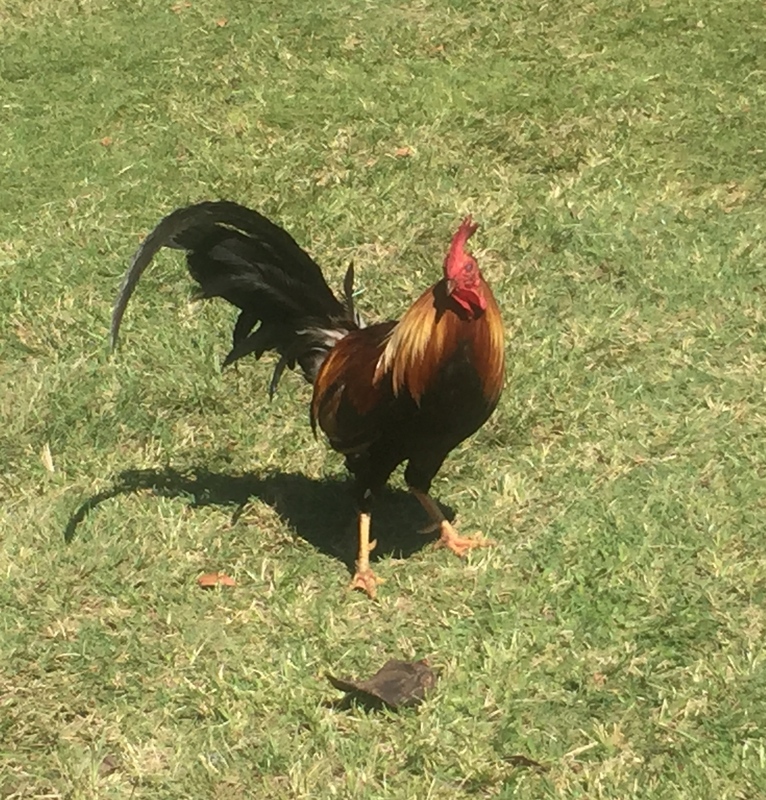 The first thing I noticed when I arrived in Kauai was the chickens. There are chickens everywhere. They were in the rental car parking lot. They were wandering alongside the road on the way to the hotel. They were outside the grocery store, at almost every scenic overlook, and at the beach on the south shore. Wherever I went, there were chickens. I joked to someone at the Kilauea Point National Wildlife Refuge that the chicken must be the state bird of Hawaii. They bristled at my comment. The state bird is actually the Hawaiian Goose or Nene, the world’s rarest goose. I saw a couple of those at the Wildlife Refuge but overall I saw many more chickens than Nene. The other thing I noticed was the Hawaiian words, towns, and street names. I recognized the letters but I couldn’t, no, I wouldn’t even try to pronounce the names of some of the places we went. I visited Wales earlier this year and had a similar challenge with the Welsh language. The official Hawaiian alphabet has only 13 letters – five vowels (which can be pronounced two different ways) and eight consonants. Although the language was on the decline, efforts are being made to reintroduce it. I hope they are successful because I find the language beautiful. 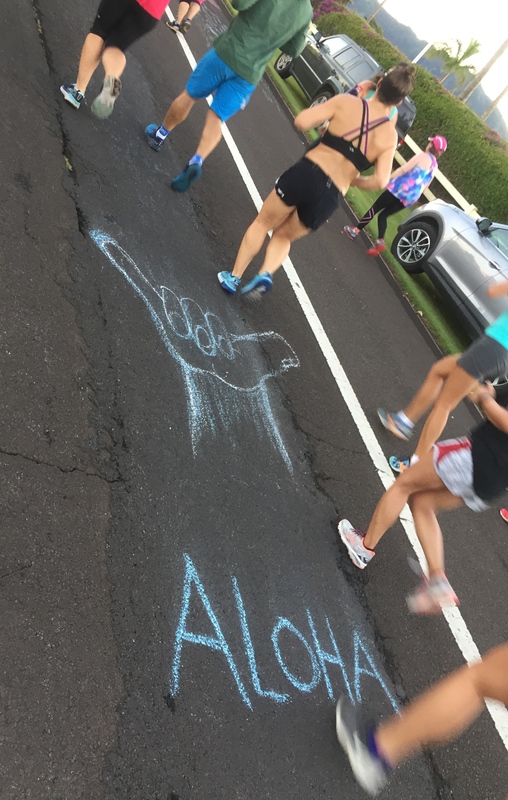 I was apprehensive about running in Hawaii. Heat is the equivalent of Superman’s kryptonite for people like me with Transverse Myelitis (TM). In hot weather, TM symptoms can flare up (referred to as Uhthoff’s phenomenon). The air temperatures in Hawaii range from lows in the mid-60s to low 70s and highs in the 80s – perfect for people lounging at the hotel pool but challenging for endurance athletes with demyelinating conditions like mine. I have to take extra precautions when I run in hot weather to manage my core body temperature. I use a “Keep It Chill” gaiter made of a Xylitol infused fabric. My gaiter has a cooling effect as long as it is wet. In most instances, my gaiter has been able to help me manage my body temperature in warm weather races. The race in Kauai was more challenging because the temperature was in the 70s at the 6 AM start. My gaiter dried out quickly and stopped cooling me off before the race even started. I realized I had to stay focused on managing my body temperature to finish this race. This woman was handing out wet sponges around Mile 7 – My Hero! 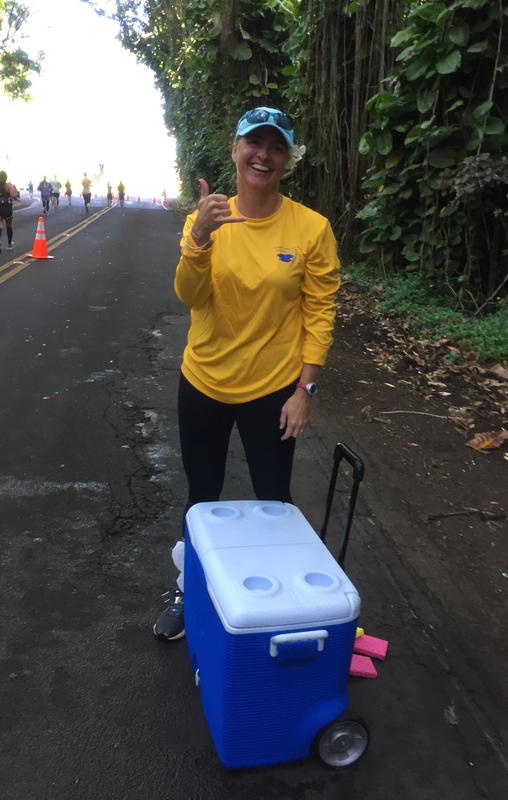 The owner of a store I visited in Hanapepe the day before the race told me the race course was tough. She said even some of the elite runners from Kenya thought the course was difficult. I brushed off her comments. She wasn’t a runner. What does she know? 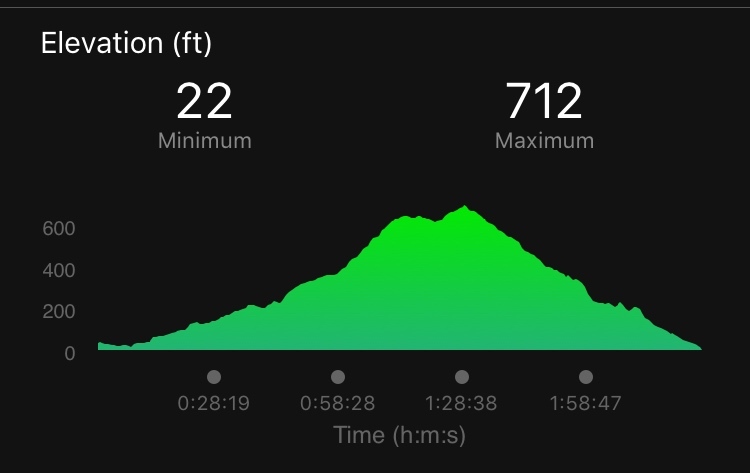 I have run hills and in heat. I wasn’t going to have any problems. But when I started the race, I realized she was not exaggerating. Although the scenery was gorgeous and the sunrise as the race started was breathtaking, the first 7+ miles were all up hill. It somehow seemed appropriate the music coming from the stroller being pushed by a male runner was Led Zeppelin’s “Kashmir”. It fit the grind I felt running uphill in the heat with limited shade. I tried to keep up with him just because I enjoyed his music but he sprinted ahead of me. I enjoyed a respite from the sun between Miles 5 and 6 when we ran through the Tunnel of Trees, huge eucalyptus trees that formed arches over the road. They provided welcomed shade. About Mile 7.5 the course started a downhill to the finish by the beach. I was able to make up some time. While I didn’t have my worst half marathon finish, it certainly wasn’t my best. I am just happy I was able to complete the course. 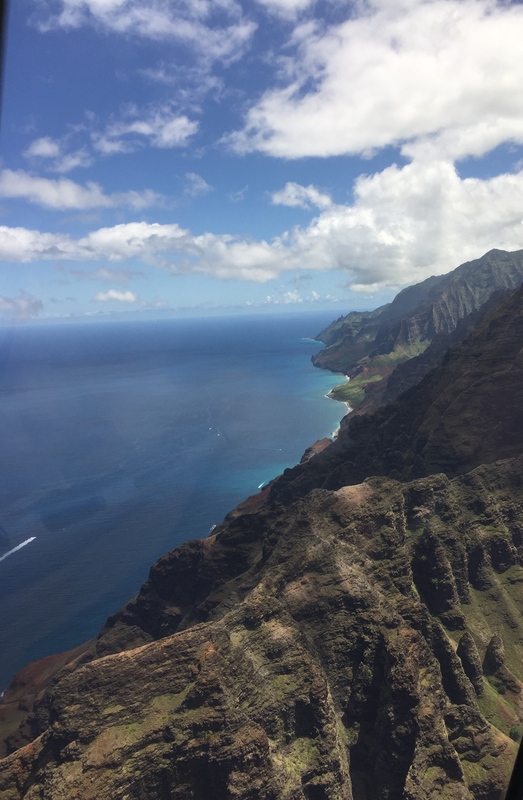 While I was in Kauai, I took a helicopter tour of the island with Blue Hawaiian Helicopters. A helicopter tour is the only way to see Kauai since most of the island is inaccessible from the ground. I was delighted to be assigned the seat in the front row next to the pilot. 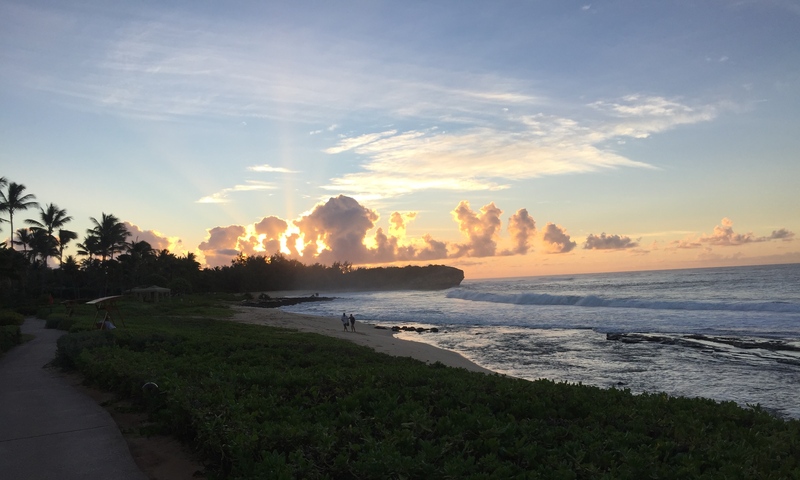 Because of its perfect weather and beautiful scenery, many movies have been filmed in Kauai. During the tour, our pilot pointed out places we might recognize from movies including Mana Waiapuna (commonly referred to as “Jurassic Park Falls”) and the nurses’ beach from “South Pacific”. We flew over Waimea Canyon, the famed “Grand Canyon of the Pacific”. Finally we flew into the center of Mt. Waialeale, the ancient volcano that created the island of Kauai. Mt. Waialeale is also one of the wettest spots on earth, with an average rainfall of 450-500 inches annually. Not surprising that we saw many waterfalls all over the island. The helicopter tour with Blue Hawaiian Helicopters was the best part of my trip to Kauai. I would do that again in a heartbeat. In case you don’t know the song, here is a video of Led Zeppelin performing “Kashmir”. My favorite version of “Over the Rainbow” by the late Israel “IZ” Kamakawiwo’ole, a famous Hawaiian singer. The scenes at the end were filmed at his funeral. ← A Life Lesson from Mr. V.